In the following guide, we aim to answer that question by offering an in-depth review of the best camping axes and hatches currently on the market and a detailed analysis of what goes into the making of the ideal axe for every type of adventure. Let’s start off with our top picks of the best survival axes per category for 2019. How To Choose A Camping Hatchet? For lovers of old-school aesthetics and no-nonsense, frill-free efficiency, look no further than the Gransfors Bruks Wildlife Hatchet. This classy-looking hatchet is a model that doesn’t mess around with too many of the fancy bells and whistles found in many more modern style of hatchet, but has a heck of a lot going for it in terms of performance nonetheless. Using a 13.5-inch hickory handle, a 1-pound head, a 3-inch blade, this hatchet ticks all the boxes that need ticking. The only real downside to this hatchet, beyond the price, is that it can occasionally come with the odd minor flaw as a result of each ax being entirely handmade. For the most part, these slight irregularities are purely aesthetic in nature and shouldn’t put any prospective buyers off purchasing. Those in the market for a high quality, old-school style hatchet that’s truly built to last won’t find many (if any) better options than this. On first impressions, the Schrade Tactical Hatchet couldn’t look more different than the Gransfors Bruks Wildlife Hatchet featured above, but in terms of quality, effectiveness, and all-around performance the two are all but inseparable. With its carbon steel blade, nylon fiber handle, and sleek, black-steel finish, the Schrade offers a far more modernistic take on the camping hatchet than many of its traditionally styled peers, but owing to its light weight and a handful of useful features—a pry bar, a molded nylon-fiber grip, and a spike pommel in the head—is an absolute pleasure to use and even offers something of an upgrade in terms of functionality. It may lack the striking power of longer or heavier axes, but the attention to detail in the Schrade is such that it feels more like a finely tuned tool than something built purely for swinging at chunks of wood. All told, this is a well-balanced and very well-made hatchet that will do everything you need it to do short of processing very large quantities of wood. If you’re in the market for a hatchet that will serve as a wood-processing chopper alone, this probably won’t be the product for you. If, however, you’re looking for a multi-purpose tool that’s more than capable of light wood processing and ideal for more nimble tasks around the campsite, this one more than merits a place on your shortlist. There are few more versatile backcountry tools or gear items than the tomahawk. In addition to their traditional military and tactical uses, they can be used for a variety of purposes around the campsite, including chopping, splitting, digging, prying, cutting rope, and, of course, throwing! At 15.75” in length, the SOG Tomahawk will appeal to anyone who’s not overly concerned with portability and looking for a multi-purpose, versatile backcountry tool that comes into its own as an instrument of self-defense and, perhaps more importantly, poses the ideal foil to campsite boredom—set up a few (preferably inanimate!) targets around camp and you’ll be in for hours of entertainment trying to take them out as you work on your throwing skills! The only downsides to the SOG Tomahawk are those found in any tomahawk—namely, that it isn’t made with high-volume wood processing in mind. However, most buyers in the market for a tomahawk will most probably place their priorities elsewhere—self-defense, versatility, and the ability to multi-purpose around camp in a number of tasks. Tomahawks are not designed to have the same chopping and cutting ability as regular hatchets or axes but are ideal as multi-purpose backcountry tools that have that all-important bonus feature of “throwability”! For those short on pack space, the Bear Grylls Survival Hatchet by Gerber offers a solution that’s well worth looking into. This tidy little hatchet lacks the striking power of many competitors owing to its short, 9.5-inch shaft length, but the flipside of this compromise is that you get a very portable, lightweight, functional, multi-purpose tool that’s very easy to wield and use for a variety of smaller campsite tasks. By far the most lovable feature of this hatchet is its confidence-inspiring rubber grip and the sharpness of the blade, both which make the performance of more delicate tasks far easier, even when the weather’s doing its worst to make them difficult. With some hatchets, the possibility of our grip slipping in wet conditions or when working up a sweat—and losing a finger or two in the process!—is never far from the forefront of our thoughts. With the Bear Grylls Survival Hatchet we need have no such worries—the rubberized, articulated handle and handy finger notches closer to the ax head mean we stay in control and finish our cutting and chopping with no few fingers than we started it with! A superbly portable, functional little tool that defies its diminutive proportions with impressive performance. If you envision having to do larger campsite tasks like constructing a camp with large branches, chopping and splitting wood, this hatchet’s small dimensions make it less suitable than models with a longer shaft. As with any outdoor gear item, how you plan on using your hatchet will largely determine the type of hatchet you should be buying and the specific design features you should be looking for. If you’re pitching your tent close to where you park your car, then you have a little more leeway as regards the amount of weight you can carry. In such a scenario, carrying a heavier and bulkier hatchet or ax becomes more feasible. This will allow you to perform heavier-duty tasks, such as chopping large logs for firewood and driving stakes when pitching (larger) tents. In most cases, the priority for backcountry campers—that is, those who have to hike significant distances before pitching their tent—is on keeping things lightweight and portable. As such, backcountry campers will probably give preference to hatchets that offer as much as possible in terms of performance while maintaining a low pack weight and easily packable dimensions. In most cases, this will mean compromising on wood-processing capacity but leave plenty of options that are ideal for driving in tent stakes, chopping kindling, splitting smaller logs, shaving tinder, and trimming branches for firewood. Many campers buy a hatchet with at least one eye on saving their own skin in survival situations. While almost any hatchet will do the job in this respect, certain designs lend themselves to self-defense more than others, namely those with a longer shaft that lets you maintain more distance between yourself and the aggressor, those that can be thrown with accuracy, and also those that can be worn where they can be easily accessed. As you might have guessed, the hatchet type that ticks these boxes most emphatically is, in most cases, the tomahawk. The size of your camping hatchet is crucial for two reasons: firstly, portability; secondly, its cutting or chopping capacity. Shorter, lighter models of hatchet will provide you with the dexterity required to perform more delicate campsite tasks without wearing your arms out in the process and allow you to do so with more precision and speed. Larger models will make heavier tasks like chopping wood and splitting logs far easier, but also have a tendency to snag on undergrowth or thick foliage when bushwhacking, can tire out your arms when used for repeated small tasks, have less dexterity, and, of course, weight a lot more in your pack. Anyone who has ever seen the movie 127 Hours will understand why it’s a very good idea to buy backcountry gear that’s well made and fit to task. While we seriously hope that none of our readers will ever have to chop off any of their limbs à la Aron Ralston, it would still be a great shame and huge disappointment to discover your hatchet can’t do what you need it to do when called upon. When buying your camping hatchet, the main things to look out for are the materials used in the shaft and the hatchet head. Shaft: The only way to gauge the true quality of a hatchet shaft when buying online is to do a little detective work and read user reviews to find out how the shaft performed when put to use. An important point for those buying hatchets with a wooden shaft is to take note of the wood’s grain direction. The grain of the wood should run towards the blade because this orientation makes the wood more capable of withstanding extreme force than a horizontal grain, as explained in the video below. Head: The highest-quality axes, for the most part, are those made with forged steel with a high carbon cutting edge, which enhances both durability and resistance to dings and nicks in the blade. With most outdoor gear, there’s a trade-off between weight and some other desirable feature or characteristic. With a camping hatchet that trade-off is with cutting power, with shorter axes offering far less “oomph” than their larger competitors. For any kind of serious chopping and wood processing you should be looking for a shaft length of at least 13”, but also bear in mind that this is likely to add significantly to the ax’s pack weight if headed far from the roadside to do your camping. Ideally, the weight of your hatchet should be well-balanced, with the head carrying at least two-thirds of the overall weight to give you more control and avoid stinging your hands when striking—a frequent occurrence with blades that are too light. 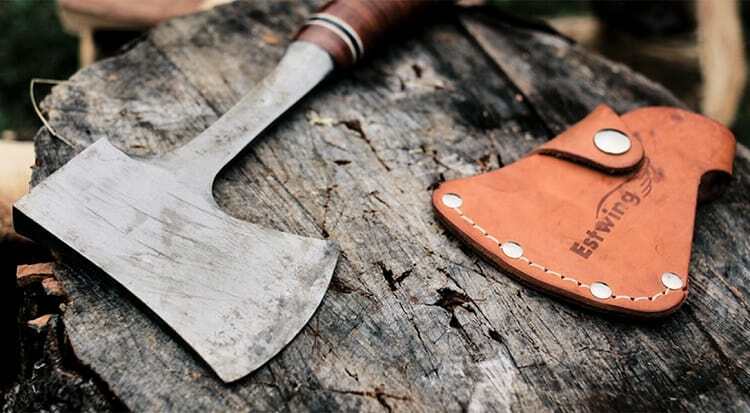 The durability of your hatchet will be determined by a number of factors, none of which are more important than the materials used in both the handle and the head. Two points are well worth noting with regard to durability, particularly with hatchets that use a wooden shaft. Firstly, wood can be susceptible to rot, splintering, and contorting over time, making it a less reliable option in the long-term than fiberglass, steel, or other shaft materials. Secondly, single-piece, full-tang hatches usually excel in terms of durability by dispensing with that one point of potential weakness where the head joins with the shaft and thereby eliminating the problem of the head loosening over time. 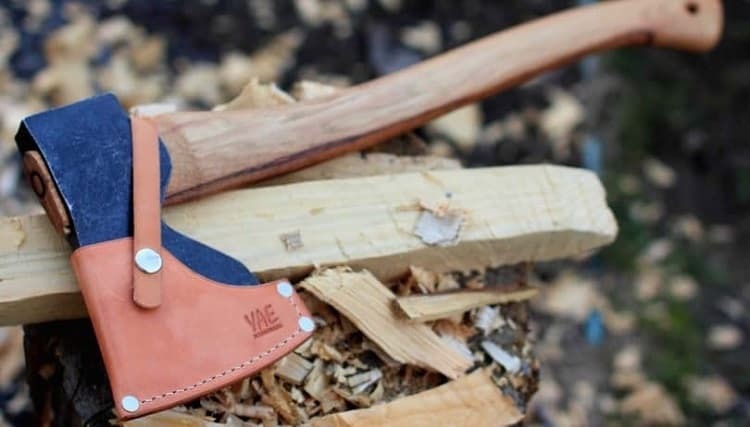 The number of brands out there producing great camping hatchets is fairly large—almost as large as the number of those making cheaply made, inferior quality, sure-to-fall-apart imitations. To avoid the latter of these two, we’d recommend buying a hatchet with a tried-and-tested, trustworthy brand name. What type of hatchet is best for camping? This will ultimately depend on your intended use of the hatchet and the type of camping you plan on doing. For car-camping trips, a hatchet that’s closer to an ax in size might be your best bet given that portation is not a big concern and the added length and weight of a larger ax will give you more chopping power. As always, however, that increase in size will mean a little less in terms of dexterity and precision. For trips into the backcountry, a bona fide hatchet or tomahawk will most likely serve your needs better, offering the ability to process smaller quantities of wood but also better performance with more dexterous, detailed tasks, and adequate self-defense in a far more portable package—important when space in your pack is at a premium and every additional ounce has to earn its place. What is the difference between a hatchet and an ax? The terms “hatchet” and “ax” are often used interchangeably, but there are significant differences between the two. Axes are generally longer and designed to be used with two hands, while hatchets are smaller and used with one hand only. This relates directly to the intended use of each tool—while axes are commonly used for larger tasks felling trees or chopping logs, hatchets excel with more delicate, intricate tasks like clearing brush, trimming branches for firewood, chopping kindling, or even food prep. How long should my hatchet handle be? The length of your hatchet’s handle has a significant bearing on the hatchet’s overall striking power. In short, the longer the handle the greater the striking power. That said, with longer handles, there’s usually an accompanying increase in weight, which can result in arm fatigue and be overkill if you’re using your hatchet for smaller jobs at camp. Longer handles are also more difficult to maneuver and make more delicate tasks trickier. Again, how you envision or plan on using your hatched will define your parameters length-wise. What size of camping ax should you buy? As with the length of your hatchet’s handle, the overall size of your hatchet or camping ax depends on how you plan to use it. 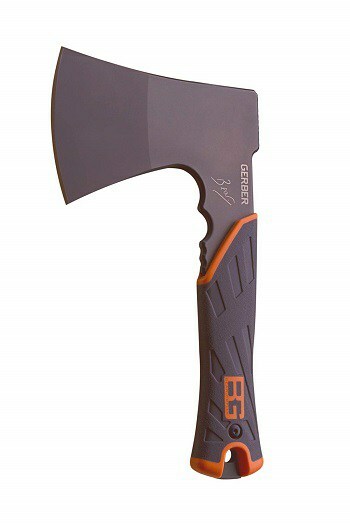 For tasks that require more agility, smaller axes like the Gerber Bear Grylls Survival Hatchet will probably be ideal, allowing you to work with greater speed and accuracy; for “meatier” tasks and heavy wood processing, weightier models like the Gransfors Bruks Wildlife Hatchet will serve your purposes better. How to sharpen a camping hatchet? Sharpening your hatchet is very similar to sharpening the blade on your knife. A variety of tools can be used to sharpen your hatchet, but the most time-efficient method is to begin with a file and then progress onto a whetting stone to finalize the job and remove any bur from the blade. Camping hatchets offer far more than just a means of making yourself feel like some modern-day Chuck Norris about the campsite or on your trips into the backcountry. More than any other outdoor accessory we know of, this small addition to you kit can make life a whole lot easier when it comes to carrying out dozens of the most important campsite tasks—so much so that most long-term users will agree that a good hatchet can quickly become any camper’s best friend. Whether you’re in the market for an awesome means of self-defense, an old-school, no-nonsense wood processor, or a multi-purpose, highly functional backcountry tool, there’s a hatchet out there that’s perfectly suited to your needs. Whatever those needs may be, in the list of items featured in our review we’re sure you’ll find the one that’s destined to become your backcountry “bestie” for many years to come.